Why does my Gift Certificate user get a "no payment method is available" error message? Your shopper is unable to checkout when using a gift certificate that is larger than their order amount. The most likely cause is that the shopper has a zero balance after using their gift certificate (since it covers more than the product purchase) and no payment method is available to "cover" the zero balance. 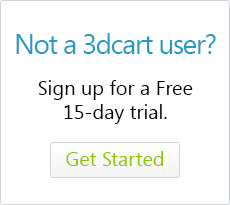 By default, 3dcart does install an offline payment method for "no payment necessary" but it may be inadvertently hidden. Simply log into your admin panel and navigate to Settings =>Payments, and click on the "Select Payment" button (located under "Payment Methods"). Once there, look to the far right of the "No Payment Necessary" listing and click on the on/off switch and ensure that it is green (turned on). Save the page and your gift certificate order will now work. If the No Payment Necessary method is not in the Payment Methods section, you can easily re-create it. Simply click the Add New Button, type No Payment Necessary in the Name field, and select "Custom" from the Payment method drop down menu. Just be sure to enter '0' for both the Min. and Max. Order Amount fields and click Save.